One of my bigger regrets in life is the fact I had just a regular camera for 36 shots when my children were small. I wish I had so many more photos. Better quality too.... But then, if this is one of my bigger regrets my life is not so bad . At least my memory is good and I remember how much fun we had the day this photo was taken. I remember how much my daughter was enjoying walks between all these beautiful flowers, big pool with salty water , great meals and so much more. This special photo was waiting for me many years and the very first day I got all the Primrose collection I knew what I wanted to do for my project. 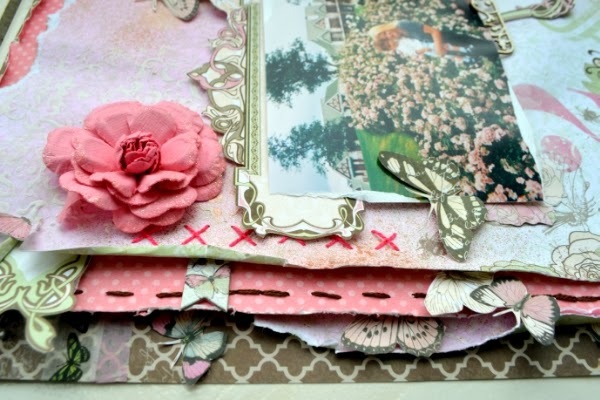 I love fussy cutting so this will be another favorite collection for me, so many lovely elements to cut off! 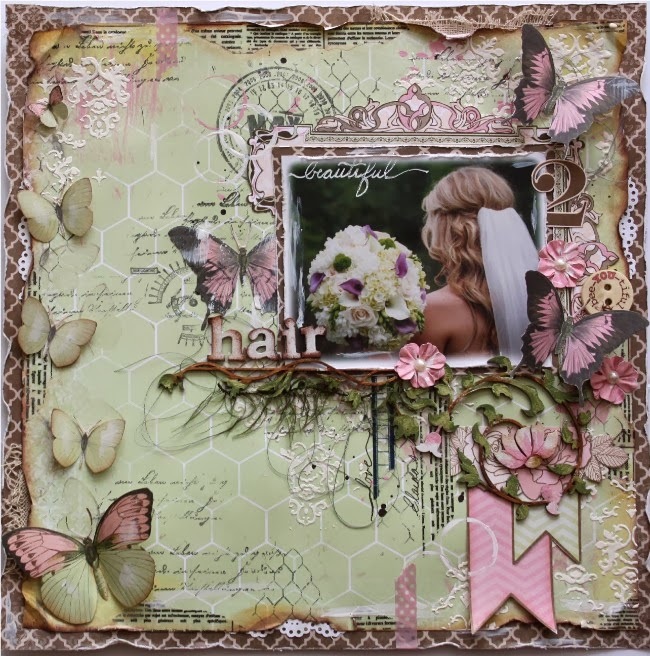 Gabrielle here to share with you my layout using the gorgeous new Primrose collection! As soon as I laid eyes on this collection, I had so many design ideas whirling through my head. So many beautiful elements to create with. I've been wanting to do a pretty soft feminine page design for this photo of my nephews bride....there are always so many pretty details in a wedding and I just loved this photo that showed off her hair and bouquet. 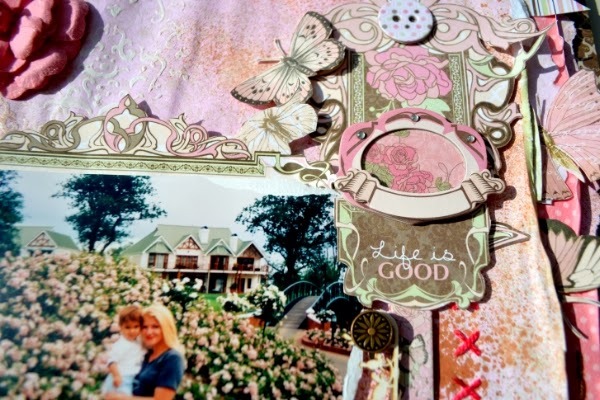 The first thing I did when I got my collection was sit down with a few of the patterned papers (while watching TV) and fussy cut the butterflies and labels from the Bliss and Garden papers. This way I was ready to roll when I started in on my layouts. I also went a little crazy with the new Washi Tapes! I used a whole bunch of strips to outline the framework of my background paper, then added random strips here and there as finishing touches. I wanted to go for an artsy/mixed media style background on this one, so I used lots of Bo Bunny texture and background stamps along with inks and texture paste. 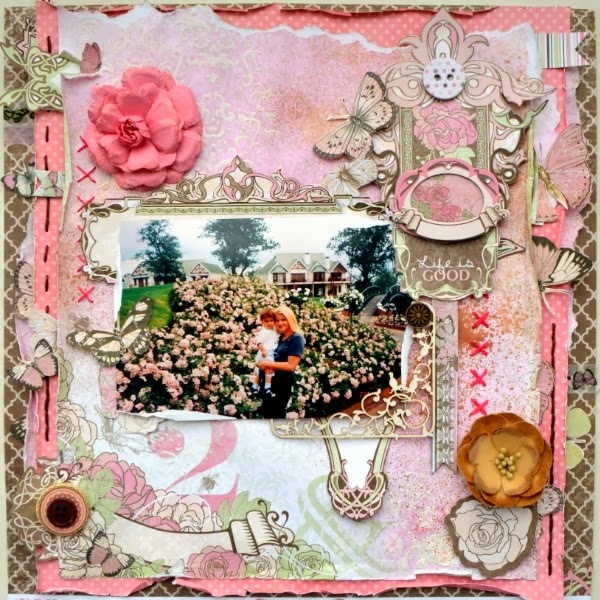 The small pink blooms where made from one of the patterned papers using a flower die. I wrote part of the title on my photo using a white Signo Unibal gel pen, this one writes very well on photos. These lay-outs are both truly breathtaking! I'm amazed by your gorgeous work with this gorgeous collection! These projects are very beautiful!!!! so beautiful, such a great imagination!!! love it, thank you for sharing. Do you add a varnish or hodpodge to your fussy cut butterflies? They look like their wings are stiff, so how did you do that? I've also seen pages that describe using clear or sparkle type of finish. Thanks so much, they look nice!